Australia's teacher Professional Standards require teachers to demonstrate proficiency in Aboriginal pedagogy, history and perspectives. This paper will outline their introduction and the concern that teachers may feel about implementing them. It discusses the findings of a study investigating a group of primary teachers' perceptions of their capacity to meet these standards. An Aboriginal research paradigm underpinned the design of the study, which took place within a cultural interface theoretical framework (Nakata, 2007). A multiple case study methodology was utilised and data were gathered using group interviews, which were analysed using thematic coding. Findings were that teachers did not feel confident in meeting the two specific standards. Their suggestions for professional learning that would meet their needs are presented. In a departure from Western conventions, a painting by the author offers a visual representation of the research study. Providing cohesion and a visual expression of the implementation of the study, the painting also represents its various facets. I would like to firstly acknowledge with respect the ancestors of the country in which this study was conducted, the Gadigal, Bidjigal and Dharawal people of Eora country. I would also like to acknowledge my own ancestors the Mununjali people of Yugambeh Country and Nganduwal/ Minjungbal people of Bundjalung country. Taking this time to pay my respects to these peoples and countries through this acknowledgement is to locate myself firstly as an Aboriginal woman and then as the researcher for this study. In Australia today, much has been written about the fact that education for Aboriginal and Torres Strait Islander children and young people is far from equitable (Buckskin, 2012, 2013; Dodson, 2009; Martin, 2009; Sarra, 2009). For example, "Indigenous student (47.2%) attendance rates are lower compared to non-Indigenous students (79.4%) from the first year of high school to year 12" (Buckskin, 2013, p.4). Low attendance often equates to poor achievement and "Indigenous students (45.4%) are less likely to complete year 12 compared to non-Indigenous students (88.1%)" (Buckskin, 2013, p.4). Statistics show a persistent trend of Aboriginal and Torres Strait Islander students performing in the lower bands in literacy and numeracy. Aboriginal and Torres Strait Islander educational outcomes are measured against minimum mainstream standards, which are supported by the government rhetoric of 'closing the gap'. These statistics are a result of a continued deficit model of Aboriginal and Torres Strait Islander funding and approaches to Aboriginal and Torres Strait Islander education. The deep rooted system in my painting discussed below represents a history of polices entrenching deficit thinking, which contributes to current educational statistics. What is not revealed in these statistics from government and educational provider reports, is that "for too many Aboriginal students' families, schooling continues to be an unfulfilling experience and in too many ways, an unfulfilled goal" (Martin, 2009, p.1). Martin (2009) has argued that, in order to improve education outcomes for Aboriginal and Torres Strait Islander children and young people, there needs to be recognition of, and a space for, Aboriginal worldviews. This would seem to indicate that Aboriginal ways of seeing, knowing and being would need to be at the forefront of any professional learning for school leaders and classroom teachers. Challenges have been made by Aboriginal and Torres Strait Islander education leaders to mainstream education to enhance the wellbeing of Aboriginal children and young people. They suggest that this can be achieved by recognising their distinct identities and the use of a "strength-based approach" (Perso, 2012, p.18) to build relationships with Aboriginal parents, families, care-givers and communities. In the painting (Figure 1) the trunk of the tree symbolises standing solid in country, cultural identity, and community. The current study sought to enhance understandings of how contemporary inequitable educational outcomes can and should be improved if we are to meet our international and national obligations. Australia has agreed to be bound by the United Nations Convention on the Rights of the Child (1990) which states that all children have the right to an education that lays a foundation for the rest of their lives, maximises their abilities, and respects their family, cultural identities and languages. As a signatory to the Declaration of the Rights of Indigenous Peoples (United Nations, 2007), Australia has recognised in particular the right of Aboriginal and Torres Strait Islander families and communities to retain shared responsibility for the upbringing, education and well-being of their children, consistent with the rights of the child. In the education sphere, where this study is nested, concerted collective action on the part of key stakeholders has resulted in there being a focus on the education of Aboriginal and Torres Strait Islander children and young people in the Australian Professional Standards for Teachers (AITSL, 2011). There are four levels in the Standards, depicting increasing levels of knowledge, skill, and leadership, running from graduate for those just completing their teacher education course to lead describing principals and executive teams. There are 37 Professional Standards that teachers are obliged to meet and provide evidence of meeting on graduation, and as they become increasingly expert teachers. The Standards reflect and build on national and international evidence that a teacher's effectiveness has the most powerful impact on students. This has been well articulated in Hattie's (2008) work, where he synthesises a wide range of research on what has the most positive effect on student learning. There is a groundswell of goodwill evident in Australia and a determination to improve outcomes for Aboriginal and Torres Strait Islander students. Concrete evidence of this is that government, largely made up of non-Indigenous people and expressing their will, has developed the two Standards specifically related to meeting the educational needs of Aboriginal and Torres Strait Islander students and teaching about Aboriginal cultures, histories and languages to all students, thus harnessing the commitment of all to the notion of reconciliation. A report (Ma Rhea, Anderson & Atkinson, 2012) commissioned by the Australian Institute for Teaching and School Leadership found that teachers across the country argue "that much more can be done to improve what is being offered" and that there is a "lack of systemic level planning for teacher professional development in Aboriginal and Torres Strait Islander education as part of workforce development" (p.52). This study sought to contribute to the body of knowledge that may lead to improved outcomes for Aboriginal and Torres Strait Islander children and young people. The bright blue sky of the painting (Figure 1) symbolises this space for new knowledge and the potential benefits for Aboriginal and Torres Strait Islander children and young people at the cultural interface of schooling. In order to achieve this, in the current study, teachers' perceived capacity to meet the two Standards 1.4 and 2.4 were explored, together with their views on what professional learning they would recommend in order for them to feel confident about meeting the two Standards in question. 2.4 Provide opportunities for students to develop understanding of and respect for Aboriginal and Torres Strait Islander histories, cultures and languages (AITSL, 2011). I think in terms of visual conceptualisation, therefore I created a painting, Figure 1: Standing solid and tall (Buxton, 2015), which represents aspects of the literature review, the findings and the positives as the findings culminate in action that may potentially enhance educational outcomes for Aboriginal and Torres Strait Islander children and young people into the future. The concentric circles in this painting represent learning on the different levels. The yellow and orange represents the spirit moving in between realms of knowledge — physical, intellectual, emotional and spiritual. The blue represents water — a natural resource vital for life, an energy source, custodial relationships expressed through cultural practices. The browns and ochre represent country, the foundation of knowledge. The trunk of the tree symbolises strength in and layers of learning. The roots deeps within Mother Earth represent grounding in life lessons. The painting is also a visual representation of the study in its entirety. The deep roots in the country are the history, policies and educational statistics, impacting on the wellbeing of Aboriginal children and young people, which is the context of the study. Growing from history and statistics is a realisation that a transformative learning pedagogy should be adopted. The trunk of the tree symbolises strength and layers of meaning. I interpret the development of the Standards as evidence of goodwill and a newfound willingness to do something positive: to grow in understanding through professional learning. The branches are the new directions; the leaves represent the findings of this study. The bright blue sky represents the unlimited potential and benefits that this new knowledge might achieve. In order to best ground the research and to guide the interpretation of the data, this study took place within a cultural interface theoretical framework (Nakata, 2007). Building an Indigenous standpoint into a theoretical framework requires more than the inclusion of Aboriginal and Torres Strait Islander narratives and perspectives (Foley, 2002; Nakata, 2007; Yunkaporta, 2009). It requires the recognition of the existence of Aboriginal and Torres Strait Islander knowledge systems and an understanding of the complexities of the cultural interface. Therefore, an Aboriginal and Torres Strait Islander standpoint can never be reduced to just the inclusion of Aboriginal and Torres Strait Islander content (Nakata, 2007). Edwards and Buxton (1998) explained an Aboriginal way of being as an interrelatedness of people, land and spirit. Foley (2002) conceived this epistemological standpoint as grounded in Aboriginal knowledge of spirituality and philosophy. Nakata argued that the elements and relationships in this space are how one's thinking, understandings, knowledges, identities and histories change in a continuing state of process, our "lived realities" (Nakata, 2007, p.199). According to Nakata there are three guiding principles to Indigenous standpoint theory. Firstly, Indigenous people are entangled in a very contested knowledge space at the cultural interface; secondly, to move forward it is necessary to recognise the continuities and discontinuities of Indigenous agency; and, thirdly, there needs to be the understanding of the continual tension that informs and limits what can be said and what is left unsaid in the everyday (Nakata, 2007, p. 215-216). Nakata (2001) has also described the successful application of the cultural interface theory in schooling as requiring that Aboriginal and Torres Strait Islander 'lifeworlds' be the starting point. He recommends that the next step is extending learners in the overlap with non-local realities, maintaining continuity with the past while learning skills relevant to the present and the future. He further asserts that the cultural interface approach is not simply a platform for Aboriginal and Torres Strait Islander students to transition into mainstream education, but is a "source of innovation, critical thinking and problem-solving skills that are relevant for learners of any culture" (Nakata, 2001, p.8). This approach could counteract deficit views of culture and go a long way to removing tokenism, by skilling up teachers and in turn young people in the art of critical reflection without losing their own cultural standpoint. The purpose of the research was to investigate a selection of primary teachers' views on their current capacity to meet the Standards 1.4 and 2.4, and if they perceived a gap, what professional learning they would suggest. The current study utilised a multiple case study methodology. "Case studies provide a unique example of real people in real situations" (Cohen, Manion & Morrison, 2011, p. 289). A multiple case studies methodology was utilised to gain a range of data across five primary schools, some with high or low Aboriginal enrolments and some with low or high socio-economic status (SES). This range of cases was used to gain greater depth for an analysis of emerging concepts and key themes, which provided me as researcher with the ability to see trends common to all sites and those particular to specific circumstances. Case studies "recognize the complexity and 'embeddedness' of social truths ... (and) can represent something of the discrepancies or conflicts between viewpoints held by participants" (Cohen, Manion & Morrison, 2011, p. 292). Furthermore, it provides "participants' lived experiences of, thoughts about, and feelings for, a situation" (Cohen, Manion & Morrison, 2011, p.290). This current study sought to investigate the breadth and depth of teachers' knowledge about Aboriginal histories, cultures and knowledges to inform the professional development they would like to receive in this area. Also, it sought to understand teachers' perceived capacity to teach Aboriginal and Torres Strait Islander children and young people effectively. Thus the advantages of a multiple case study were aligned with the objectives of the research. However, according to Cohen, Manion and Morrison (2011), while a case study is "strong in reality", it is "difficult to organise" (p.292). In the current study, this proved to be the case with permission being sought from busy principals, for whom this was not usually a priority, and in one case took several months to organise. The data, however, proved to be "strong in reality" which was deemed more important than another methodology which might have been easier to organise (Cohen, Manion & Morrison, 2011). A purposive sample of teachers from five Catholic primary schools in the Eastern Region of the Archdiocese of Sydney was chosen. The sample comprised two primary schools with high Aboriginal enrolments (one low SES and one high SES) and two primary schools with only a few Aboriginal enrolments, and one primary school in a high SES area with no Aboriginal or Torres Strait Islander enrolments. This is a representative sample of Catholic systemic schools in this region. In total 32 teachers volunteered to participate in group interviews as part of the study. Data were collected form semi-structured group interviews with voluntary members of school leadership teams and teachers from five schools in the Eastern Region of the Archdiocese of Sydney. Semi-structured group interviews were used to gather data. Up to six staff members from each of the purposively selected schools were invited to take part in the group interview. As the participants had been working together for a while, there was likely to be a level of trust between them and, potentially, a common goal with the research. Furthermore, since participants were contributing to the content of the professional development program to be developed, it was useful that they heard what others had said (Cohen, Manion & Morrison, 2011). Data were analysed using thematic coding of interview transcripts: first the transcripts of the interviews were read to discover emergent themes and categories, allowing themes and meta-themes to emerge. Those initial clusters provided the broad view and the subsequent line-by-line coding allowed for higher and higher levels of abstraction to be reached. Line-by-line coding was then followed by identification of pertinent text. This was then summarised and linked to the meta-themes and sub-themes as these developed. The literature emphasises the need to teach understanding of and respect for Aboriginal and Torres Strait Islander histories and cultures and, further, why it is important to include Aboriginal and Torres Strait Islander perspectives across key learning areas. There has been limited research, however, conducted about the most effective way to instruct teachers on how to include these histories and cultures in their everyday teaching. The role of this work appears to have fallen to the responsibility of individual education systems of schools, with little rigorous research conducted in order to determine the effectiveness of approaches to the teaching of Aboriginal histories or about Aboriginal cultures and languages. ... we have been so antagonistic to the representation of that philosophy in our schools ... We don't need to close the gap or reconcile Aborigines. We need, instead, to know our history, learn from it and do something about our greed. (p. 91). Nevertheless, this was a strong emphasis from participants in the current study: "I think there is a fear of saying it wrong" (Participant 14). The flow-on effect from teachers' uncertainty and concern about causing offence, is that they may be "viewed as politically incorrect — sometimes it is like walking on eggshells" (Participant 18). Instead of taking the risk, some would omit the perspective altogether from their programming, "We are terrified of doing something more offensive than of saying nothing at all" (Participant 7). Firstly, being 'politically correct' is a White concept. It is not a reality in Aboriginal ways of seeing and knowing. In Aboriginal ways of teaching and learning there is an open and honest communication within a safe space for students to be where they are in their learning, anything they do from there is just their next step. Secondly, this could be attributed to what Rose (2012) has termed racism by cotton wool as a result of Australian education systems overtly suppressing and devaluing aspects of Aboriginal knowledge. In absence of this knowledge, teachers who have a willingness to do the right thing but are afraid of getting it wrong, take an easier option. Participants were highly capable and dedicated teachers, yet they were not prepared to take risks and embark on the more authentic tasks, which they would relish trialing in other learning areas. One key focus of any professional development should be to empower non-Indigenous teachers to feel they have the efficacy to 'say something' and not let the fear of putting a foot wrong get in the way. In reflecting on their current practice, there were some examples of teachers considering that their practice was leading to good outcomes for children and young people when Aboriginal perspectives were included in their teaching. They noted a shift in the students' confidence as a result of authentic learning. It is interesting to note participants' responses to the following auxiliary question that was put to them during the interview: What positive effects on their learning have you seen, when children start to learn more about themselves and be strong in their identity? It is "a nice solid foundation point in that they can see, or hear about Aboriginality, ... and it's been valued within the school community" (Participant 25). Authentic. It wasn't forced and I think that really helped, I wouldn't say everyone, but many of the students to deepen their understanding at a real level. Kind of given permission because we were talking about it so much, so at some point he [the Aboriginal boy in question] obviously had a shift where he became more verbal because he's not shy, but he is a quieter boy. Like he is quite happy to chat but he's not there sort of offering his opinion and speaking up in every conversation.... So he would say his 'great Aunty said' because it happened to a family member, someone in his family. It just seemed to flow and then some of the other girls in particular and a couple of the boys chose something [Aboriginal experience] to research as a result of those conversations. And it was really quite emotional you know when they got into it. Very real. From this it became clear that when Aboriginal and Torres Strait Islander children and young people see their identities, histories and cultures valued in their schooling and visible in their classrooms, it can be seen in their self-efficacy, their willingness to participate in class discussions is enhanced. Then learning becomes relevant through lived experience. This type of positive outcome was envisaged and represented in the leaves of the tree in the painting discussed earlier (Figure 1). Across a number of interviews teachers mentioned that they did not know much about the local Aboriginal culture or history. These teachers commented that it was this lack of knowledge that inhibited their teaching of Aboriginal perspectives in their respective classrooms. Within the group interviews, teachers voiced their concern that their lack of knowledge could lead to superficial, tokenistic, and potentially damaging outcomes for students: "We do it on a really tokenistic level so we can tick it as done. But with no depth. Lots of us did the token art lesson" (Participant 8). Aboriginal and Torres Strait Islander educators have highlighted the dangers of teachers presenting Aboriginal content in their classes where children only learn superficial generalisations about Aboriginal peoples and cultures. Linking to the theoretical framework, if this occurs, as noted also by participants in the current study and as identified by Nakata (2007), it is problematic to represent Aboriginal knowledge to non-Indigenous and Torres Strait Islander children where their learning becomes rigid and stereotypical. The participants concluded that a professional development program would need to address teachers' insecurity about current practice by providing them with appropriate ways of thinking about their learning and teaching strategies and by providing opportunities to practise. Teachers expressed their dissatisfaction with what they are doing with regards to Aboriginal knowledge and perspectives, especially in schools with a significant population of Aboriginal and Torres Strait Islander students, because: "we are not part of that culture, because we all have our own cultures. I have never had schooling on it, teaching on it, so I know I have huge gaps" (Participant 11). Teachers were tentative about their own efficacy in this area, and consequently preferred to rely on the work of others; moreover, they described a lack of engagement and a tendency to relegate the preparation for this area to a place after other curriculum areas. As noted by several authors, (Martin, 2003; Yunkaporta, 2009; Nakata, 2008), it is essential that the starting point is Aboriginal lifeworlds and that Aboriginal knowledges are valued as equal to Western knowledges. This would need to be an important theme in professional development offered to teachers to assist them to feel less inadequate. Teachers need opportunities to develop their knowledge beyond surface knowledge, deeper levels of knowledge, the importance of connecting to country and all that entails, in a way that is appropriate for children and young people. This knowledge would be on many levels: physical and intellectual, to emotional and spiritual. In learning this way, one develops an awareness of connecting to 'country' on deep levels within oneself (Edwards & Buxton, 1998). This conceptualisation is visually presented in the painting discussed earlier (Figure 1). As people grow in understanding, so does their sense of country; this needs to have a strong focus in any professional learning opportunities for teachers. The focus of future professional development needs to assist teachers to move beyond the sole use of outsourcing, or the study of isolated and unrelated elements of Aboriginal cultures. Rather, they need to be empowered to engage with Aboriginal ways of knowing, to find a learning space, the interface between Western curriculum knowledge and Aboriginal knowledge. Participants need opportunities to "engage in negotiating a space where common ground could be determined and built upon in culturally safe, yet challenging ways" (Yunkaporta & McGinty, 2009, p. 56). The literature (Buckskin, 2013; Dockery, 2011; Martin, 2009; Phipps & Slater, 2010; Sarra, 2010) highlights the importance of teachers having or developing the requisite knowledge of the cultural identity of Aboriginal and Torres Strait Islander children and young people. Participants in the current study consistently expressed a fragility of confidence in this matter and an uncertainty of where to go to obtain information. As Participant 2 stated: "If we did want to have that background where do we go for that kind of information?" Participants also noted that professional development opportunities for classroom teachers in the teaching of Aboriginal and Torres Strait Islander students is extremely limited, almost non-existent at the time of this study. This mirrors the findings of Moreton-Robinson et al. (2012) and Ma Rhea, Anderson and Atkinson (2012). The majority of teachers interviewed expressed their limited knowledge of how Aboriginal children and young people learn and about Aboriginal pedagogies. Participant 9, for example, stated: "especially for someone that's had no experience or no background, nothing in Aboriginal education". Yunkaporta (2009) maintained it is an unfair expectation placed on classroom teachers if "[t]hey are expected to do something that nobody has shown them to do" (p.5). This raised the question of whether there is a widening of the gap between different ways of seeing and knowing. In the group interviews this discussion wove around a number of aspects. Participants noted that if all that is seen is difference — Aboriginal students' different ways of thinking, different ways of seeing, different ways of speaking, and different ways of behaving — it could be considered aberrant. Yunkaporta (2009, p.5) argued "when one operates and comparisons are made on a surface level of knowledge people only see differences across cultures. You have to go higher and deeper, then you will find the vast common ground, the interface between different cultures". Participants noted that other priorities set by schools and the system, as well as their own feeling of inadequacy in how to tackle the job, make it less likely that teachers would have the time, expertise and motivation to go higher and deeper, also recommended by Yunkaporta (2009). There is a significant body of literature suggesting that teachers are not confident in their ability to effectively teach Aboriginal children and young people (Mooney, Halse & Craven, 2003; Yunkaporta & Kirby, 2011; Burgess & Cavanagh, 2012; Craven, Yeung & Han, 2014). Despite goodwill and the best of intentions evidenced in the group teacher interviews, many teachers expressed their concern about their limited understanding of Aboriginal knowledge, pedagogies, and ways of seeing and learning. One participant reflected the views of teachers generally: "I don't think they realise and I didn't until I came here — how Aboriginal children do learn in a different way. You only know that when you are teaching them" (Participant 6). This view was expressed as quite discrete from their lack of confidence about their knowledge of Aboriginal histories, discussed earlier. Their comments focussed expressly on their competence to teach Aboriginal children effectively. A professional learning opportunity would need to explore teachers' lack of 'relatedness' in Aboriginal ways of being (Edwards & Buxton, 1998), doing and knowing (Martin, 2005). Teachers need opportunities to reflect on their own standpoint in order to find common ground for building cultural competence and in turn their confidence to avoid the negatives as articulated by Kickett-Tucker and Coffin (2011), and thereby become effective educators of Aboriginal children and young people. The deficit positioning of Aboriginal and Torres Strait Islander children and young people is clearly still evident in the educational system and the government expressed by the participants in the current study, and reinforcing it again with the language of 'underachievement' and 'closing the gap'. Pearson (2014) has advised people working in the field of education to beware of the pervasive and destructive effect of having low expectations. Sarra (2011) has also commented on the deficit approach to Aboriginal education and the need to avoid "the collision with low expectations" (p.287). He noted that for too long government funding and "educators have colluded too easily with the notion that Indigenous children are automatically underachievers at school. There is no basis for this belief and it is one that must be purged from our profession" (Sarra, 2009, p. 8). In an extension of this, teachers in the current study are also asking the question of what is being done to support Aboriginal and Torres Strait Islander children who are performing at or above national benchmarks and high achieving students to extend their learning, the need for high expectations. In the literature there are a number of studies (Higgins & Morley, 2014; National Curriculum Services, 2013; NSW Aboriginal Education Consultative Group, 2004; Williams, 2011) that highlight the importance of and need for parent and community partnerships with schools to support the implementation of strategies that effectively engage Aboriginal children and young people in their schooling. However, none of these studies examined in any detail the ways in which teachers are trained to, or provided with professional learning opportunities to know how to respectfully, effectively and collaboratively engage with Aboriginal and Torres Strait Islander parents, families and communities (Moreton-Robinson, Singh, Kolopenuk, Robinson & Walter, 2012). The first professional knowledge Standard, knowing your students and how they learn, states that teachers at the proficient level will need to design and implement effective teaching strategies for Aboriginal and Torres Strait Islander students, which need to be "responsive to the local community and cultural settings" (AITSL, 2011, p.9). Therefore, an important element of Standard 1.4 is the establishment and maintaining of respectful community engagement strategies, which are multi-dimensional and multi-relational (Nakata, 2007) and that need to be responsive to local communities. It was evident from the group interviews that there is a lot of uncertainty about the role of classroom teachers in building respectful, authentic relationships with Aboriginal parents, caregivers and local community members. In all of the schools included in this study teachers are looking for advice, principles and strategies to assist them in working with local Aboriginal communities. Aboriginal community consultation is a process that enables teachers and school leadership teams to become aware of local community views and sensitivities. This would involve teachers getting to know members of the local community, while at the same time opening lines of communication so community members are aware of happenings in their children's school. Authentic partnerships with parents, caregivers, community and teachers are of critical importance, but "you can't have a partnership without a relationship, and you can't have a relationship without a conversation. You've got to have the conversation" (National Curriculum Services, 2009, p.2). These concerns were expressed by teachers: "I think if you did a poll the majority of teachers in our system, probably don't know, let alone have a relationship with an Aboriginal person or Indigenous person" (Participant 6). Participants noted the consequent impact on classroom teacher's ability to work with families and communities. This clearly suggests the need for future professional learning opportunities for both school leadership teams and classroom teachers. Parents cited in Nakata's (2007) work have voiced that being Aboriginal, their lived experience of the everyday can be at times in conflict with what is expected by schools. No one can work in isolation; it cannot be one person's responsibility. It is a two way process. Like all genuinely mutual and productive relationships, there needs to be open communication based on respect, a willingness to listen, share and learn from each other. Teachers identified that they need to have "a good heart and interest" (Participant 7); they need advice and practical tips to develop effective cross-cultural communication skills to reduce the likelihood of misunderstandings. Aboriginal education is everyone's business (Wilks & Wilson, 2014) and while Aboriginal parents and communities are considered as separate from the core business of schools, the reality is that no single, specific reading or numeracy or any other program is going to be successful if not built upon authentic partnership with parents, families, and supported by the community. Teachers noted that if they were upskilled in this area it would enhance their capacity to meet both Standard 1.4 and Standard 2.4, in both of which they felt insecure. If we are serious about improving Indigenous educational outcomes we really have to begin to take responsibility — all of us — teachers, students, school leadership, communities, families at home. We have to work hard to build stronger smarter relationships among all these individuals. By doing this we can create classrooms as sacred spaces in which Indigenous children can be exceptional (Sarra cited in Stronger Smarter Indigenous Education Leadership Institute, 2009). Participants in the current study clearly articulated their hesitancy, and the challenges they perceive, in working at the cultural interface (Nakata, 2007). Overall, despite being experienced and successful teachers in general, they did not feel confident in being able to meet the two new Standards 1.4 and 2.4. In order to "ditch deficit thinking about the kids and the culture" (Participant 2), participants recommended that the following aspects be included in professional learning provided to allow them to better meet Standard 1.4 and 2.4. Finding "common ground" (Yunkaporta, 2009) at the cultural interface (Nakata, 2008). In order to achieve the objective of classroom teachers having a working understanding of Aboriginal histories and cultures and ways of knowing, represented as the circles in the painting (Figure 1), they will need professional learning opportunities. 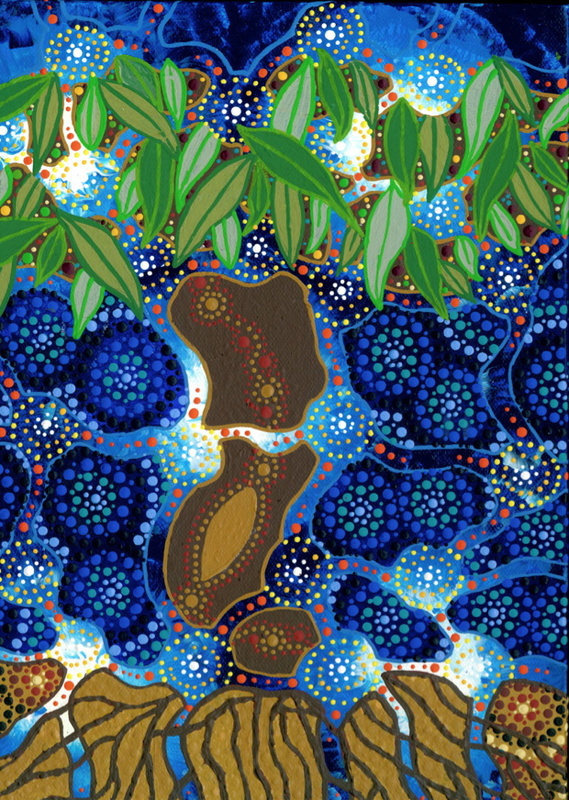 These opportunities are represented by the branches of the tree, if teachers are to support the flourishing of Aboriginal and Torres Strait Islander children and young people, the lush leaves of the tree in the painting. Buckskin, P. (2012). Engaging Indigenous students: The important relationship between Aboriginal and Torres Strait Islander students and their teachers. In K. Price (Ed), Aboriginal and Torres Strait Islander Education. Port Melbourne, Victoria: Cambridge University Press. Burgess, C. & Cavanagh, P. (2012). Real stories, extraordinary people. Preliminary findings from an Aboriginal community-controlled cultural immersion program for local teachers. Sydney: Aboriginal Studies Association NSW Australia. Buxton, L. (2015). [Painting] Standing solid and tall. Cohen, L., Manion, L. & Morrison, K. (2011). Research methods in education (7th Ed.). New York: Routledge. Edwards, C. O. & Buxton, L. (1998). Guyunggu: Teacher's notes. Wiatara: Catholic Education Schools Office, Broken Bay Diocese. Hattie, J. (2008). Visible learning: A synthesis of meta-analyses relating to achievement. London: Routledge. Kickett-Tucker, C. & Coffin, J. (2011). Aboriginal self-concept and racial identity: Practical solutions for teachers. In N. Purdie, G. Milgate & H. R. Bell (Eds. ), Two way teaching and learning: Towards culturally reflective and relevant education. Melbourne, Australia: ACER Press. Martin, K. L. (2005). Thinkin' you know... getting' it wrong... and us missin' out — Aboriginal worldview and knowledge, English literacy — great expectations or grating obsessions? Keynote presentation, Dare to Lead National Conference, What a Difference a Good Start Makes: Indigenous Early Childhood Approaches, Melbourne. Martin, K. L. (2009). Aboriginal worldview, knowledge and relatedness: Re-conceptualising Aboriginal schooling as a teaching-learning and research interface. Journal of Australian Indigenous Issues, 12(4), 66-78. Nakata, M. (2001). Changing Indigenous perspectives in curriculum areas. Paper presented at Aboriginal and Torres Strait Islander education symposium: Successful futures. Cairns, 2-12 April 2001. Perso, T.F. (2012). Cultural responsiveness and school education with particular focus on Australia's First Peoples: A review & synthesis of the literature. Darwin Northern Territory: Menzies School of Health Research, Centre for Child Development and Education. Rose, M. (2012). The 'silent apartheid' as the practitioner's blind spot'. In K. Price (Ed. ), Aboriginal and Torres Strait Islander Education: An introduction for the teaching profession. Cambridge: Cambridge University Press. Sarra, C. (2009). Indigenous leadership in education institute: Stronger smarter summit. Stronger Smarter Summit. Brisbane, 28-29 September. Sarra, C. (2011). Transforming Indigenous education. In N. Purdie., G. Milgate & H. R. Bell (Eds. ), Two way teaching and learning: Towards culturally reflective and relevant education. Camberwell, Victoria: ACER Press. Yunkaporta, T. & Kirby, M. (2011). Yarning up Indigenous pedagogies: A dialogue about eight Aboriginal ways of learning. In R. Bell, G. Milgate & N. Purdie (Eds. ), Two way teaching and learning: Toward culturally reflective and relevant education. Camberwell Victoria: ACER Press. Author: Lisa Buxton is a Yugambeh and Bundjalung woman. She is a Leader of Learning Aboriginal Education in the Eastern Region of Sydney Catholic Schools. Lisa also lectures at the Sydney Campus of the University of Notre Dame Australia.